Have you heard of a canary in a coal mine? During the late 19th century, thousands of men flocked to the Gunnison Valley, hoping to strike it rich in the mines. Crested Butte originally served as a supply town for over 15 silver mining camps that sprung up in the north end of the Valley. But it was coal, not silver, that put Crested Butte on the mining map. The Gunnison Valley boasted both Anthracite and Bituminous coal--a rare occurrence in the same valley. 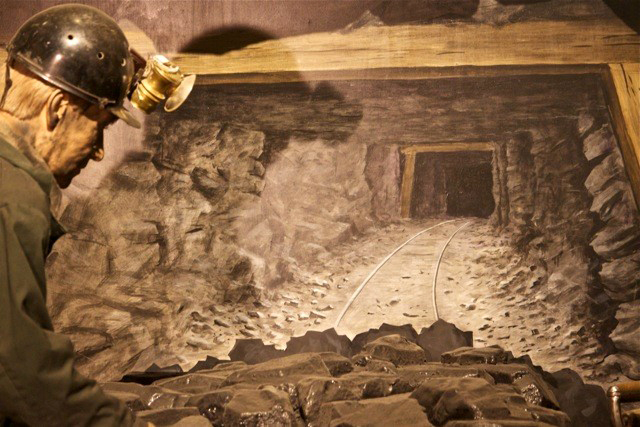 Our life size mining exhibit allows visitors to get a feel for the working conditions of early coal miners, complete with a tunnel and a surprise that delights visitors of all ages. Although early miners came here searching for gold, most moved on to California where the veins were richer. Silver was found in the Gothic area in the 1870’s and the “Boom” began. Gothic incorporated in 1879, but the mine was only open for a few years. By 1883 the “Bust” happened and the town was even smaller than Crested Butte. Irwin also grew from 1879 to 1881 with talk of silver veins. Ruby City sprung up next to the town of Irwin but it suffered the same fate as Irwin and was “Bust” by 1883. This areas claim to fame was a visit from President Grant in 1880. Coal mining sustained Crested Butte until 1952, when the Colorado Fuel & Iron Big Mine closed and the mining economy came to an end.